Extended company description: Taylor is an easy-to-use service for exchanging and investing in cryptocurrency with the help of bots. Investment goal: Support for the service and the financing of initial operating expenses including development, marketing and technical infrastructure. Taylor is an easy-to-use service for exchanging and investing in cryptocurrency with the help of bots. Taylor monitors major exchanges and conducts technical analyses to discover investment opportunities. Then it signals users about potentially profitable transactions which may be started automatically at the click of a button. As soon as a trade begins, Taylor can control the process automatically. 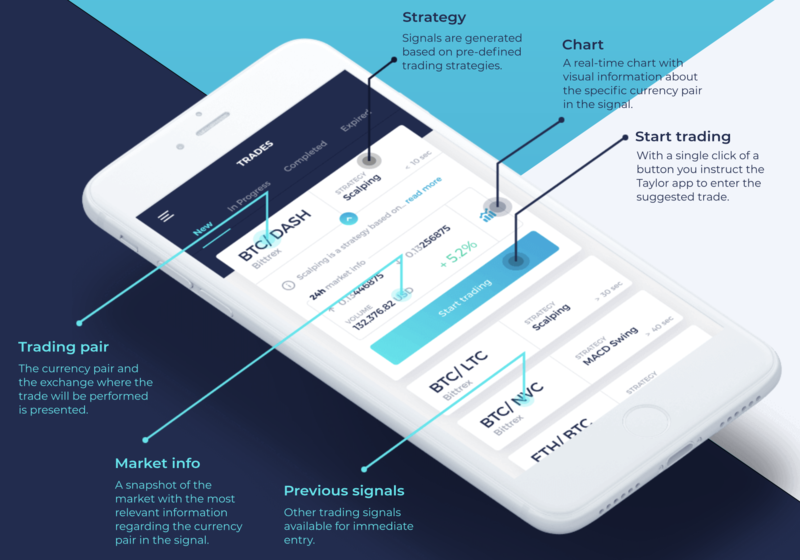 Taylor enables anyone regardless of their trading experience, to profit from the global crypto market. Amure Pinho (LinkedIn) – President of Associação Brasileira de Startups, CEO at Blogo, formerly executive director at Sync, Crossfy. Felipe Matos (LinkedIn) – Executive director of Movimento Dínamo, blogger at ESTADÃO, member of the board of UpPoints, member of the advisory board of Associação Brasileira de Startups. Andre Diamand (LinkedIn) – Member of the Advisory Council, CEO at Associação Brasileira de Startups, Chairman and Founder of VentureOne Startups, previously chairman and founder of Future Security. Everton Fraga (LinkedIn) – Software engineer at Ethereum, previously instructor at Blockchain Academy, co-founder of Dujour, Kinda Connected. Brad Mills (LinkedIn) – Analyst for Alphabet Digital Currency Fund, Bitcoin Bitcoin, co-founder and director of marketing at Slightly Social, Inc., head of monetization of Facebook games. AceOfWallstreet (Twitter) – Founder of APX Ventures, Crypto trader & influencer. NotSoFast (Twitter) – miner and trader. Ant (ThisIsNuse) (Twitter) – trader, former InfoSec specialist. APX – a venture fund. Clearify – a technical partner in security. Onfido – a technical partner in identity verification. Investments attracted: The private pre-sale raised 500 ETH in Aug-2017. The Taylor project is a platform for automated trading and investment in crypto. The crypto market is developing dynamically, which offers good prospects for the project. The team members have the relevant specialized experience and can add value to this project. The project offers a type of service that is currently in demand. Unfortunately the beta version is not yet available (the project has announced mid-January as the launch date). There was no marketing strategy or methods for attracting customers provided, which may lead to an inadequate take-up for the project. The project is still low profile, but the team’s experience should help overcome this. 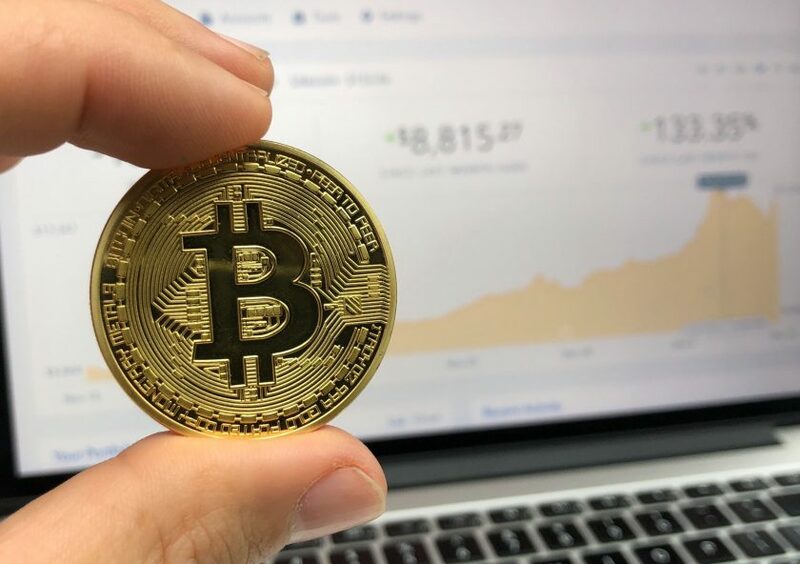 The team point out that as of November 2017, Bitcoin alone had a market capitalization of more than $100 billion; more than 1000 digital coins are traded on crypto markets. 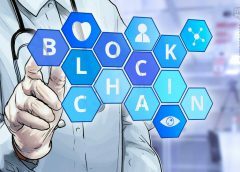 Comments: The crypto market is dynamically developing but the number of platforms providing similar services is also growing rapidly. More details about competitors can be seen in the next section. Criptoping – a service that monitors crypto markets and notifies when a crypto asset shows unusual market action. Cindicator – a crowd forecasting-platform on blockchain, providing forecasts for financial markets. Summary: There are many services offering crypto trading; however Taylor, unlike its competitors, offers rate tracking services and bot-assisted trading. Marking monitor bot – constantly monitors markets or currency pairs on exchanges (Bittrex and Poloniex). Mobile application – enables a user to view proposed transactions. 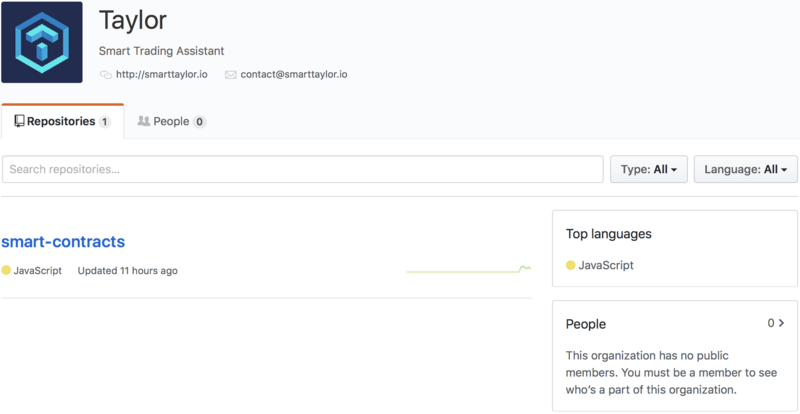 Trade bot – manages a user’s funds via API. 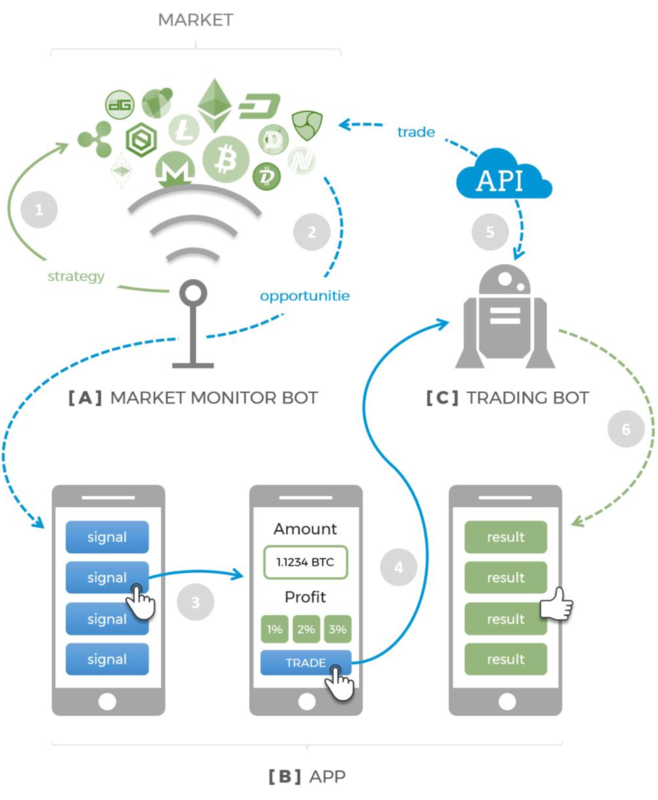 A trading opportunity (signal) is identified, the market monitor bot (A) notifies users via the Taylor mobile application (B). 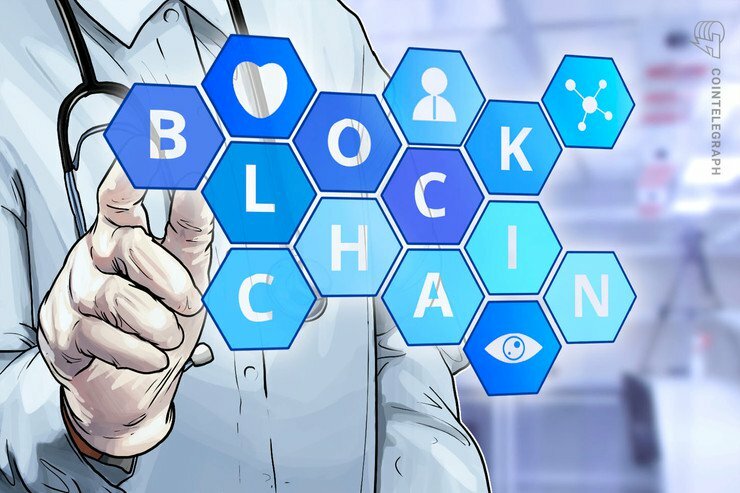 After notification, users may analyze the proposed opportunity through the application interface and decide whether they want to start a transaction. After deciding on whether to trade, the user may choose the amount to be invested and the desired target profit. The trade bot (C) then performs its action. Comments: The team uses proven technologies. 1st quarter of 2018 – Launch of the beta version of the mobile application. 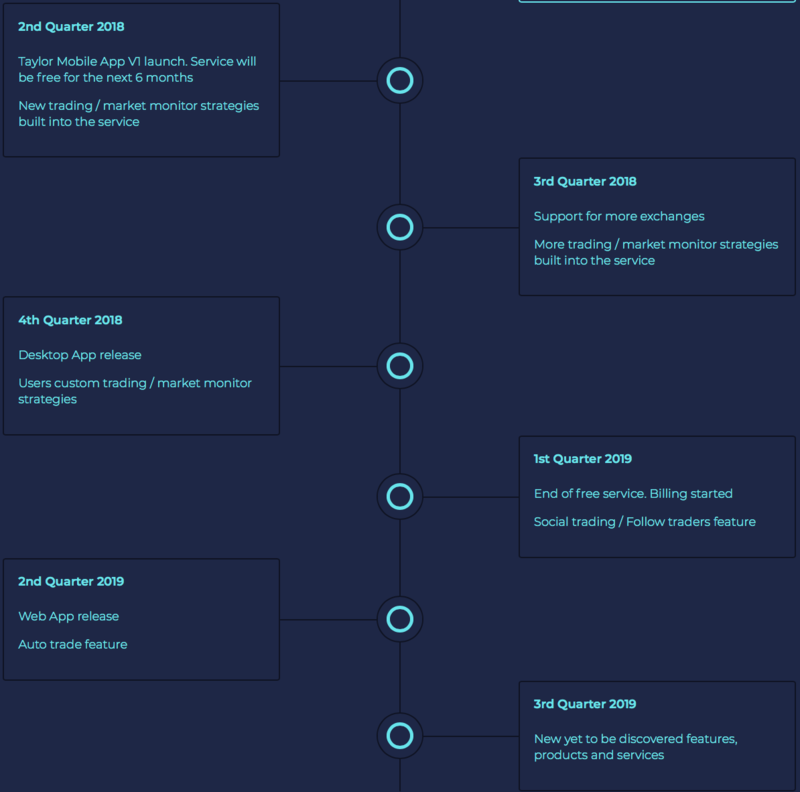 Q2 2018 – Launch of Taylor mobile app V1, development of new trade/market monitoring strategies. Q3 2018 – Support for further currency pairs, additional trading/market monitoring strategies. Q4 2018 – Release of the desktop app, introduction of social commerce/trader tracking function. Q2 2019 – Release of web app, adding an automatic trade function. Q3 2019 – Adding new and not yet discovered functions, products and services. smart-contracts – which is dedicated to smart contracts. The module is active; the last changes were made 11 hours ago (on January 30). We have analyzed the Taylor website and documentation for sufficiency and consistency for making an investment decision. 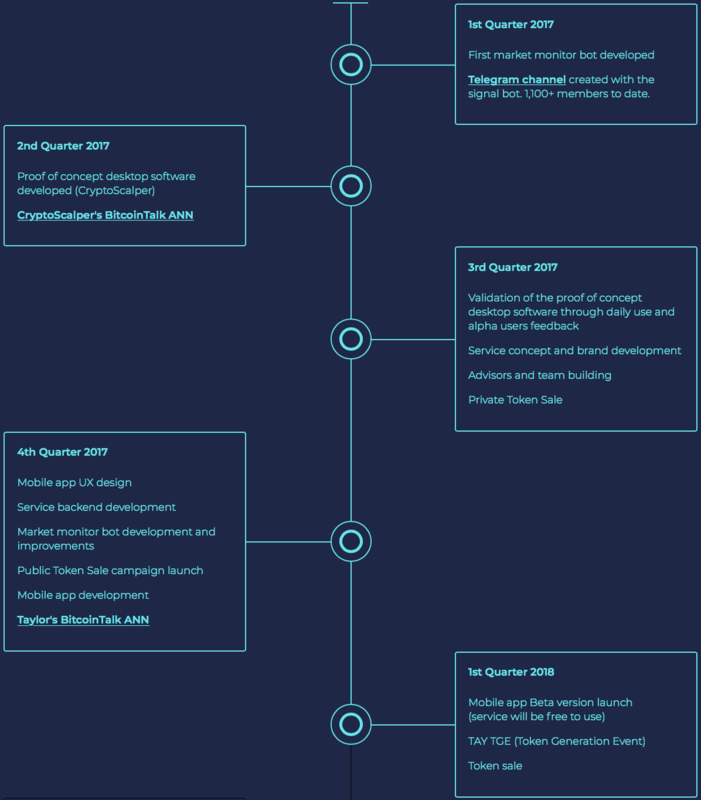 The website also provides information about the project, the ICO, the Roadmap, bounty and bonuses, the blog, frequently asked questions with answers, consultants and the team. The website is presented in English. The website features links to the blog, a description of the bounty program and frequently asked questions. Summary: The documentation enables a comprehensive view of the project. The work process of the platform is described in sufficient detail but there is not enough technical description of the project. Marketing strategy, development and plans for market entry are not presented. Tay Token is a utility token that can be used to pay for platform services. Taylor’s services will be subscription-based. Monthly subscribers receive trading signals on their mobile phones and have access to an automated trading interface. 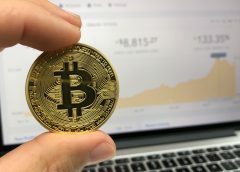 They will be able to pay for the subscription using credit cards, some cryptocurrencies such as Bitcoin (BTC) and Ether (ETH), or using the TAY token. The service charge is likely to be $60.00 per month. This price will be confirmed later after some market checks. Summary: The project has an extensive bounty program. All details of the program are available at the link above. Once all stakes are counted, users will see their TAY tokens in their Taylor accounts. Tokens will be distributed after the TAY blockchain is launched. According to the roadmap, the team has verified the demand for the service provided. It will concentrate on the mobile application. 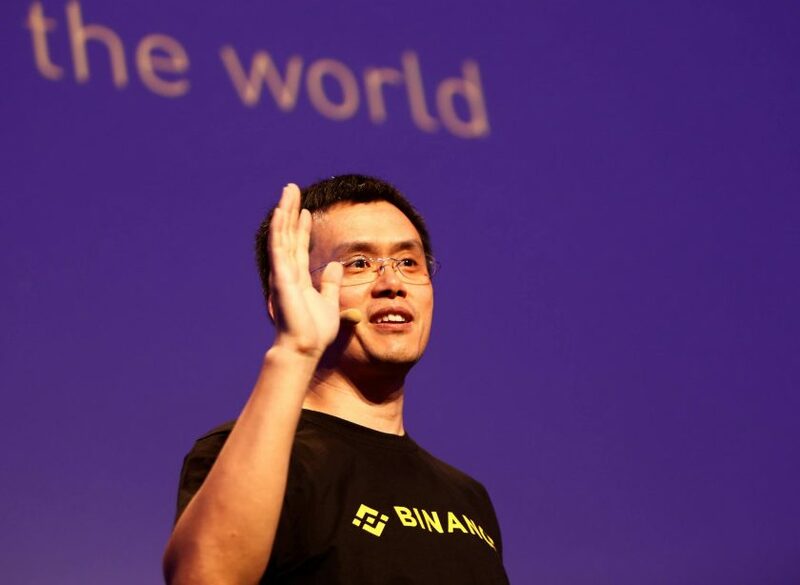 Unfortunately, the roadmap is mostly focused on the technical aspects of the project; questions about user interaction and commercial development remain unanswered. 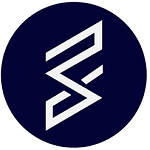 Summary: The roadmap does not disclose the project’s scaling plans; however, it contains a detailed technical component. Fabio Seixas (LinkedIn) – Co-founder and CEO. Co-founder of LeadGrid, Jack Sistemas, previously co-founder of Camiseteria.com. Thiago Régis (LinkedIn) – Chief Technical Officer and Co-Founder. Previously Drupal consultant at RNP, CEO and founder of FISQUA, public relations manager at Drupal Brasil. Rafael Salmon (LinkedIn) – Head of Marketing. CEO and founder of Codifique, Microsoft .Net Trainer at Instituto Infnet, previously CEO and co-founder of Salmon Consultoria / Vamos Innovations. The team has 10 more people. Summary: The majority of the team did not specify an affiliation with Taylor. The team is mostly from Brazil, and has the following specialists: A community manager, content specialist, public relations manager, UX designer, user interface specialist, Fullstack developers, external developer, a Solidity developer and an attorney. 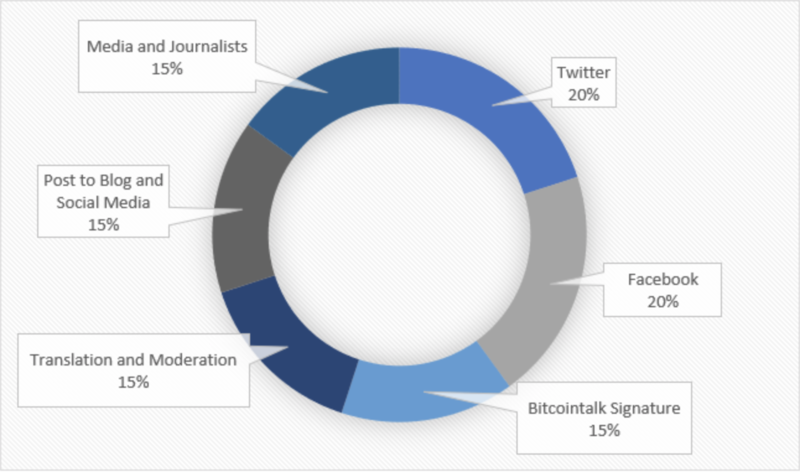 Information about the project is available via various popular services such as Twitter, Telegram, Reddit, Medium, Discord, LinkedIn, Facebook, GitHub, BitcoinTalk and YouTube. The project has a bounty program. The team is active on social media. News on the project appears regularly via Twitter and Facebook; there is a blog on Medium. The format of articles about the project shows that they were written mainly at the project’s request. Comments: Interest in the project is gradually growing. The marketing campaign is developed mainly on Facebook and Twitter. 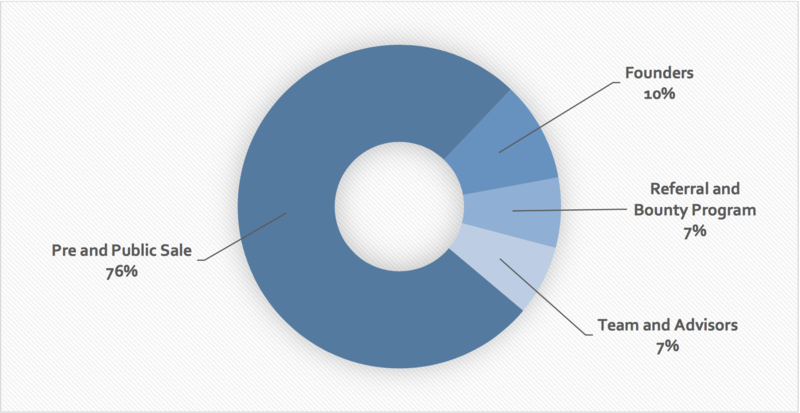 Search traffic: 1.98%, 100% from with is organic. Comments: Top 5 countries of visitor origin: Brazil – 53.85%, the United States – 11.84%, Great Britain – 7.10%, Canada – 5.43%, France – 3.14%. Referral links: medium.com: 65.15%; nyx.cz: 34.85%. Summary: Based on available data, users are just beginning to be interested in the project. The team leads its advertising campaign on Twitter and Facebook; there is a blog on Medium. Over the past month, website traffic has grown by 8000 visitors.